You see, right now the United States and countries all over the world are working together to build the International Space Station (ISS). This new station isn't going to be a lab like Spacelab or Mir. This is the real deal. The international project began in 1998 and original plans wanted it completed in 2004. Due to delays and the tragic shuttle accident, assembly of the ISS was delayed. There were even brief discussions about not completing the ISS. The space station will be made up of 44 pieces. It will have a width of 356 feet, a length of 290 feet, and a height of 143 feet. The entire station will orbit the Earth at an altitude of 220 miles. The countries of Earth plan to have the station permanently manned and conduct experiments that involve astronomy, biology, physics, and chemistry. 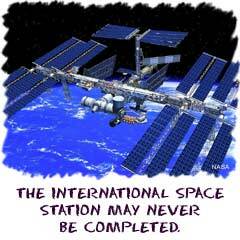 The station is our first step to having permanent installations in space and on other planets. NASA is currently planning development of Moon and Mars exploration missions. These series of missions will probably start as robotic explorers and orbiting satellite projects. Does this mean that the world is giving up on the ISS? Not at all. Many experiments are still planned for the space station and everything we learn will be used to help humans colonize other planets. In the coming decades, look for orbiters around the Moon that will transit information to Earth. Look for a series of robots that will explore the lunar surface. Finally, you may even see a temporary lab set up on the Moon's surface that will begin experiments. Realistically, human exploration of Mars is a long way off.